Thank you for an incredible five days. Your delicious cooking, warm smiles and gracious hospitality will stay with us for months and years to come. We love Koh Samui! Hoping we have the chance to come back again to stay. Best and thanks from your Irish, British, Swiss and American friends who all live in Hongkong. My husband and I decided to have our honeymoon (long overdue) in Koh Samui after hearing about how lovely the island was, compared to Phuket and other tropical destinations in the area. Needless to say, we were not disappointed! 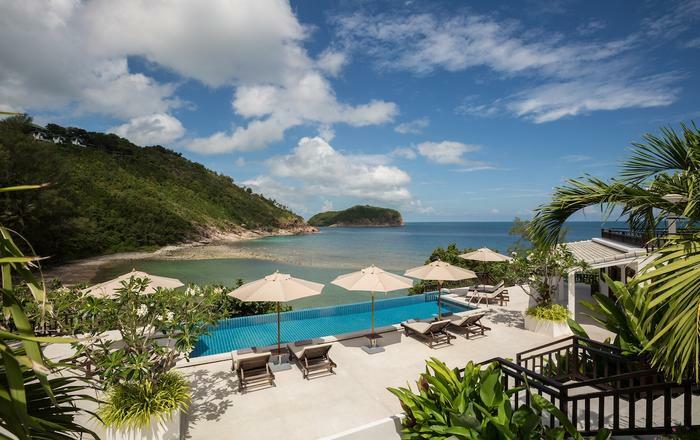 The villa is located on the Intercontinental property which has been built on the cliffs facing Taling Ngam's pristine beaches. 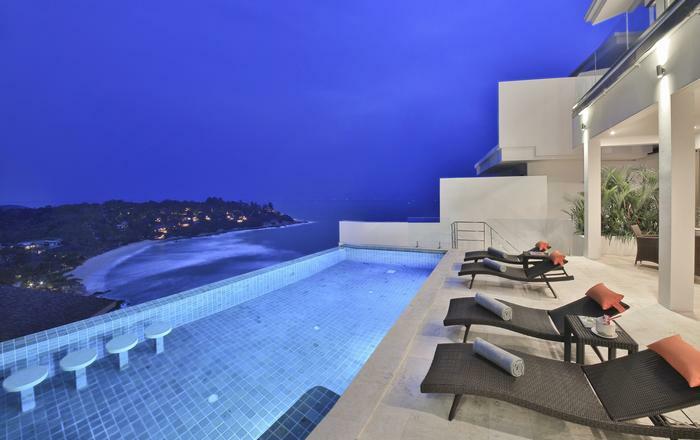 The villa itself is three floors, with balconies and perfect sea views. We loved waking up each morning to the sound of the ocean and having a healthy and delicious breakfast on the terrace. The staff were attentive and considerate and provided very helpful advice on places to go and things to see. The staff did a fantastic job organising our day trips to the waterfalls and to Angthong Marine Park, our car rental, and our in-villa massages (which were super affordable!). They also arranged for beverages and snacks of our choosing ahead of time so when we arrived, we immediately had refreshments and weren't worried about going to a supermarket or 7-11 nearby. The staff easily arranged for further items for us to be bought which made our stay totally painless. The villa itself is stunning, with all amenities you could need and artwork in each room that reflects Thai culture and elegance. We particularly loved the fresh flowers displays. The villa is very spacious and would be great for families, couples or groups traveling together. It's a great space for total relaxation and privacy. The beds were comfortable and all the bath towels and linens were of superb quality. We wanted to take the waffle robes home! Be aware that the Intercontinental property is large but buggies are available 24/7 to take you to and from the villa to the beach, the lobby, and the car park (we have never waited more than a few minutes for a buggy to arrive). The restaurant choices are limited on the hotel property but the in-villa chef is a great option (they can shop for speciality items like fresh caught fish or octopus on the day) and there is an excellent Thai restaurant that is only a ten minute walk along the beach called the Virgin's Coast --- we highly recommend going there for traditional dishes and fresh seafood which you can pre-order in advance (someone from the restaurant can also pick you up from the villa if you call ahead of time). If total rest and relaxation isn't your cup of tea, we would also highly recommend renting a car (which the staff can arrange as mentioned above, for a very affordable price). We enjoyed driving around the island and seeing the more bustling neighbourhoods in Bo Phut and Chaweng. Both locations have restaurants, tailors, shopping malls, but also nice beaches. We would especially recommend the Fisherman's Village for seafood dinner and trying Tree Tops for an extra special and romantic sunset meal high up in the trees. There are also Tesco's all over the island should you wish to do your own food shopping. Taxi's are expensive so a rental car is the way to go and parking is free at the Intercontinental. 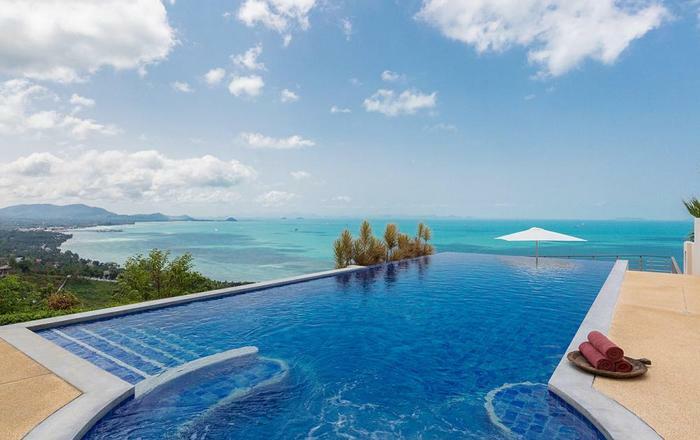 We loved our trip to Koh Samui and staying at Baan Hansa was such a special treat. The staff took care of us the whole time in a non-intrusive way and the island itself was truly unspoilt and more beautiful than we thought it would be. There are loads of things to do for the young and old alike and we can't wait to go back. This place is the most beautiful place we've ever been to. 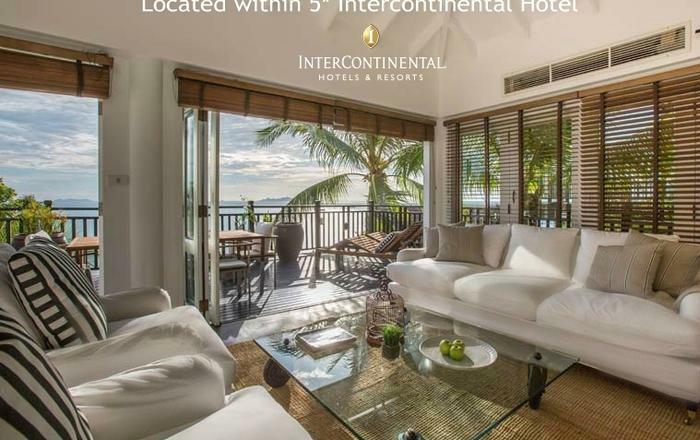 It was such a bummer to come home, but we recommend who wants it all: 5 bedroom villa with 2 staff on the grounds of the Intercontinental Hotel. Free access to all facilities included such as 5-6 swimming pools, private beach, beach toys like sail boats, kayaks, and kids club for the kids (they loved it). The plus side is this is a tranquil part of the island, quiet and safe for the kids. Limited night life but you can go to Chaweng for that. Biggest benefit of all was the luxurious 3 floor villa that allowed for the extended family to maximize time together. Could not have asked for anything more! Highlight was in-villa chef. For big families, this is the best way to go for high quality food and low cost. Love this place. Spent a week hanging around in February. The villa itself is spacious-- there were six adults and three children total staying there-- and had plenty of amenities. 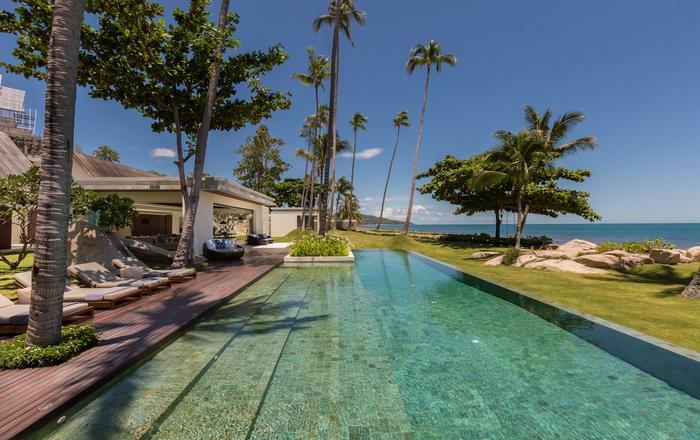 The property is beautiful, and Koh Samui is hard to beat. We enjoyed dinners on the balcony watching beautiful sunsets, and spent time lounging at the pool and on the beach. The kitchen is spacious and there is a full dining room table both inside and on the balcony. If you like swimming, there is a pool that is a flight of stairs away, so much quieter than the main pool, which is a few minutes' walk. I would also highly recommend using the cook. She did a fantastic job-- it made feeding a group that included several small children much easier. The complex also offers other nice amenities, such as bikes and kayaks free of charge, as well as fishing poles. There is also a quiet gym and a beach-side bar. Overall, the place is great for families or groups, as it offers the privacy that a hotel suite cannot, as well as more flexibility in dining, without losing the amenities of a 5-star resort. While it is on the quieter side of the island, it is still relatively easy to get out, and there were a few local restaurants nearby that were excellent. I would highly recommend it, especially for families or large groups that want great amenities but more privacy. Get ready for the best vacation ever. 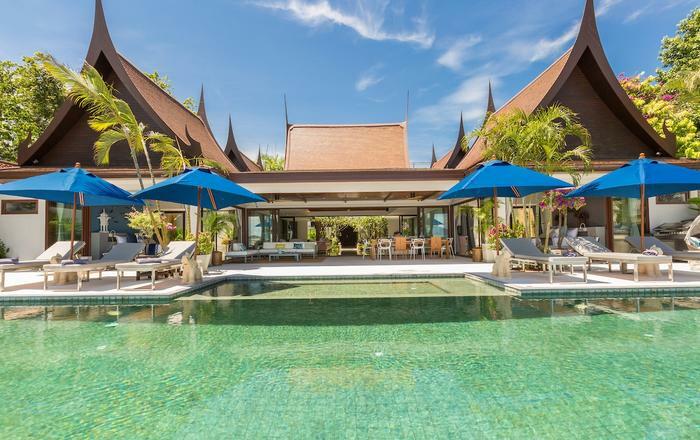 They pick you up at the airport and bring you straight to the luxury of Baan Hansa. This place was perfect: 3 floors, 5 bedrooms, 5 bathrooms, 2 amazing balconies, and a great kitchen. This is serious luxury--you might not even want to go outside! Although it is an incredibly romantic spot, there is plenty of privacy within the villa itself and it would totally work for big families or a group of friends. Sitting on a cliff overlooking the famous Five Islands, the villa provides the most AMAZING sunset views I've ever seen. (The pictures don't do it justice!) The best thing about this place is that it is both a part of the Intercontinental Hotel but also secluded. The villa itself had two staff on site who clean and manage the place and you can have a private chef if you want, who will take you to the market to pick out the menu and then cook for you right in the villa! (So cool). You have free access to all of the hotel's amenities: high speed internet, 6 swimming pools, a private beach, 2 restaurants, and a first-rate gym. You also get free access to all the land and water activities: sail boats, kayaks, snorkel gear, fishing, bicycles. The hotel provides golf cart transportation around the whole facility, including the awesome hotel spa. We didn't love the restaurant on the beach, but then that's what the private chef is for! We weren't there with kids, but it seems like a great family spot, as it is on the quiet side of the island. It's only a quick taxi ride to the nightlife, though, so we thought it was perfectly located. (This place is so awesome, though, that you might never even want to go anywhere, anyway...) A couple of things that set this place apart: great Air Conditioning and an indoor kitchen. You definitely don't always find that in Asia! (And they make a HUGE difference). Counting the days until I can go back for another stay.